This pocket size journal is a great way to record your coffee tasting experience. It is designed for ease of use with a flavour wheel to note the unique tastes. 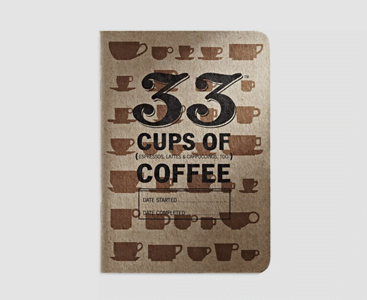 33 cups of coffee is a fun journal that allows you to conveniently rate your coffee experiences. Or have you perhaps accidentally re-purchased a coffee that you forgot you didn’t like? Keep your coffee records neatly organised in this easy to navigate book. Become a coffee expert and analyse your cup with this thorough format. Get involved in conversations by simply referring to your book of knowledge! Each page is designated for a coffee profile, which makes note taking clear and easy. 33 cups of coffee is made from 100% recycled paper which is sourced in the Pacific Northwest. 100% of the inside pages are made from post-consumer materials, which are products that have fulfilled their complete product life and have been saved from being sent to a landfill. The book is printed with US grown soy-based ink, which has many benefits such as more vivid colours, greater rub resistance, easier to recycle and it is a much safer and more sustainable option. The secret ingredient is the tiny amount of coffee that is added to the ink each time a batch of books is printed. Do you have a coffee lover in your life? This would make the perfect gift for birthdays, Christmas, a congratulation present or any other type of celebration. Its measurements are 5” x 3.5” which makes it the perfect pocket-sized book for a special person in your life. This is a one of a kind journal that is exceptional quality and made from sustainable materials. It is also fantastic value for money and the perfect way to cheer up a friend. Or are you a coffee lover that wants to keep track of your ever-growing wisdom? Treat yourself with this exciting journal. Would you like more gift inspiration? Have a look at our 34 Christmas & Birthday Gift Ideas for coffee & Tea lovers.